The wide arms and splayed, non-slip feet mean that this perching stool offers excellent stability and eases sitting and standing, or moving into and out of the shower cubicle. 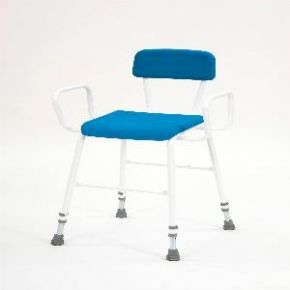 The height can be adjusted and it's strong enough to suit users up to 25 stone (157kg) in weight. This item is just what I needed. I have MS and was finding it increasingly hard to stand in my wet room shower this stool has made it so much easier for me to cope with showering on my own when I feel up to it and enabling those who care for me to assist me when I need them to.